Hungarian Prime Minister Viktor Orbán and his spouse have arrived in Hanoi, beginning their official three-day visit to Vietnam, made at the invitation of Prime Minister Nguyen Xuan Phuc. Prime Minister Nguyen Xuan Phuc (right) and his Hungarian counterpart, Viktor Orbán. Hungary is a Central European country with stable economic development. The nation advocates European Union (EU) integration and focuses on developing ties with its neighbors, in addition to the countries in the Visegrad Group (V4 – an alliance of four Central European states). In Asia, Hungary gives priority to promoting relations with powers and certain traditional countries, including Vietnam. Hungary has always participated proactively and actively in the activities of regional and international organisations, such as the United Nations and the Organisation for Security and Co-operation in Europe (OSCE). With a history of 67 years, the traditional friendship and multifaceted cooperation between Vietnam and Hungary have been continuously cultivated by the leaders and peoples of the two countries throughout many generations. This good relationship has been marked by high-level visits between the two sides, most recently the visit made to Hungary by Chairwoman of the Vietnamese National Assembly (NA), Nguyen Thi Kim Ngan (April 2017), and the visit to Vietnam made by Vice President of the Hungarian NA, Gergely Gulyás (January 2017). 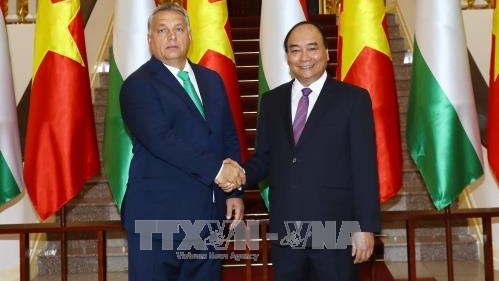 In its Look East policy, Hungary highly appreciates and pays great attention to strengthening their relations with Vietnam. Cooperation between the two sides in multilateral forums, such as the United Nations and the Asia-Europe Meeting (ASEM), has been facilitated exceptionally. The two countries have signed many agreements and cooperation deals, creating a legal framework for consolidating their bilateral cooperation. It is pleasing to see that the economic ties between Vietnam and Hungary have achieved significant steps forward over the past few years. Two-way trade turnover reached US$266 million in 2016, up 36.28% over 2015. The Vietnam-Hungary Joint Committee on Economic Cooperation has endorsed the role of promoting bilateral collaboration. So far, Hungary has been operating 15 direct investment projects in Vietnam, which are still in operation now, with a total registered capital of over US$50 million. In January 2017, the two sides signed a framework agreement on credit cooperation worth EUR440 million, in order to implement development assistance projects in the fields of water management, pharmaceuticals, information technology, agriculture, security and national defence. Bilateral cooperation in culture, tourism, education and training, has also been fruitful. Hungary has helped to train thousands of scientific and technical officials for Vietnam. Starting from the 2017-2018 academic year, the Government of Hungary has increased the number of scholarships granted to Vietnamese students to study in Hungary to 150. Cooperation between the two countries’ localities has also been actively facilitated. The Vietnamese people always remember the enthusiastic and precious support that the Hungarian Government and people have offered to Vietnam in the country’s past struggle for national liberation, as well as in its current cause of national construction and development. The Vietnamese community, of more than 4,000 people in Hungary, has been provided with favourable conditions in terms of residency and business, becoming a bridge of friendship to promote the bilateral relations. The ongoing, official, visit made to Vietnam by Hungary PM Viktor Orbán and his spouse affirms the determination of the two countries’ leaders and peoples to further enhance the traditional friendship and multi-faceted cooperation between Hungary and Vietnam, as well as to strengthen the political trust between the leaders of the two nations. The visit also offers an opportunity for the two sides to exchange measures aiming to promote bilateral cooperation in a more substantive and effective fashion, whilst discussing regional and international issues of mutual concern, thus contributing to peace, stability, cooperation and development in the world.